Apart from Delhi and Mumbai, one the most sought-after cities to visit in India is Udaipur. Needless to say, it is beautiful, scenic, and oh-so-romantic! You would be surprised at how lovely this city is as well as the possible hotels you can stay in. They have a-plenty! 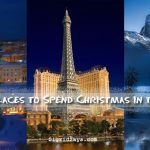 It is my wish to be able to bring my entire gang of four for a family travel and then get to stay in one of these scenic hotels in Udaipur. Udaipur is considered as the most romantic and charming city in India. Here are some of the most scenic hotels in Udaipur that you can stay in. Take a look at some of the grandest and most scenic hotels in Udaipur. Plus get to know about the things that this charming city of India has to offer. 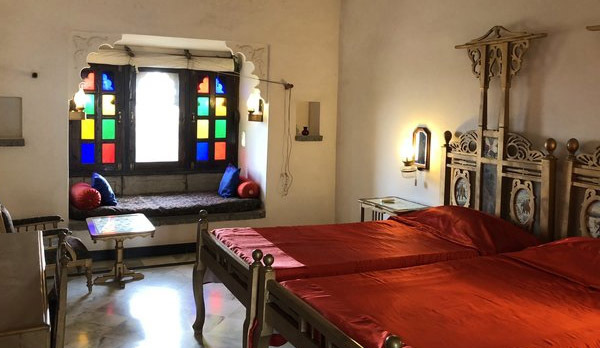 Karni Fort Bombora, Udaipur is a unique hotel that gives you a glimpse of a bygone era. It’s a restored fort with opulent modern furnishings and decors, but guests can still revel at the plush royal heritage of the Rajputs. 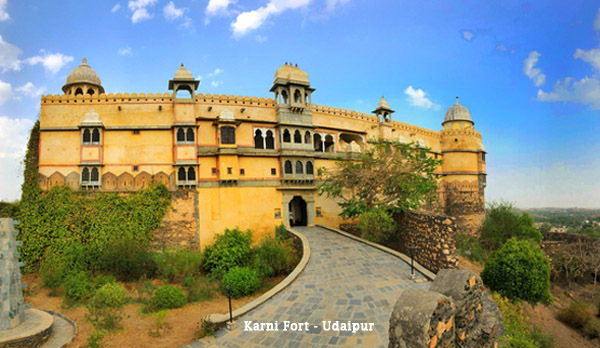 Look at how majestic Karni Fort in Udaipur is! Gosh, I wish I can stay there even just for two nights. Karni Fort is located near ICICI Bank Main Market, Bambora, Udaipur Rajasthanat. It is only about 55 kilometers away from the city of lakes Udaipur. The rooms at Karni Fort reminded me of a royal TV series that I have watched for several years. From the name itself, Radisson Blu Udaipur Palace Resort and Spa is a palace—and an opulent one at that. The 245 rooms are modern, well-appointed, and the beds are very comfortable. Plus, the hotel has all the amenities that you need for a great stay—pool, gym, spa, and impeccable service that Radisson Blu hotels are known for all over the world. They also have the biggest, pillarless ballroom in the city. Radisson Blu Udaipur is beside the lake. Lovely view by your room. Located at B-1, Ambamata Scheme – A Rd, Opp. Aravali Hospital, Malla Talai, Udaipur, Rajasthan 313001, India. 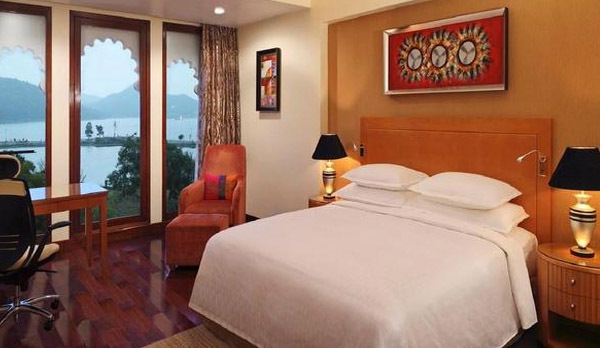 The room with a lakeside view at Radisson Blu Udaipur. 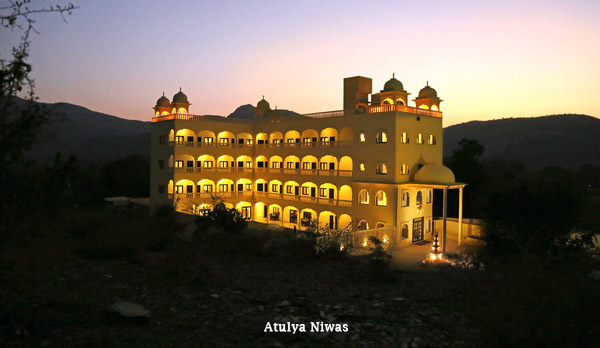 Located in the Udaipur suburbs, the Atulya Niwas is a modern hotel that was built according to the ancient haveli style. 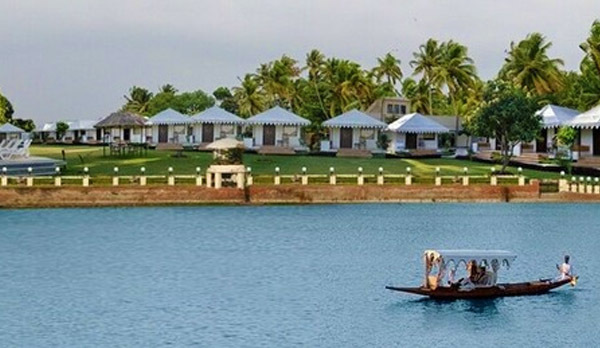 What’s nice about this hotel is that it is near the Lake Pichola and the Bagore Ki Haveli. They also have a pool and other amenities needed for special events. Atulya Niwas is surrounded by hills. Would be nice to take early morning walks around here. A room set up at Atulya Niwas. The Hotel Shree Vilas is located at the Pichola Lake in Udaipur. 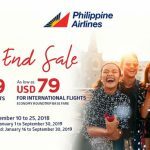 It is only about a kilometer away from the City Palace complex as well as transport hubs. What’s nice about the Shree Vilas Orchid is that it is not a building. The luxury cottages at the Shree Vilas Orchid in Udaipur. You get lakeside view. They have a total of 20 luxury cottages that all have a private sit out. This set up lets you take in the breath taking views of Lake Pichola and Sajjan Garh Fort. The hotel also has lakefront gardens with an infinity pool. This is just lovely. Would you like to stay in a hotel that has a lot of history and speaks of old Indian architecture? Then Hotel Shree Jagdish Mahal in Udaipur is the place for you. The hotel used to be a 250-year old Nagar Seth Ri Haveli that was renovated into a heritage hotel. 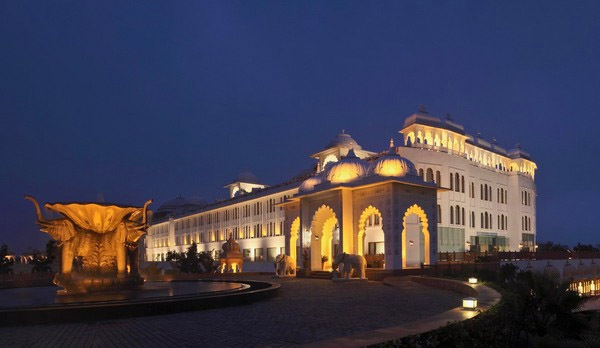 The exteriors of the hotel bear intricately carved designs that speak of the grandeur of the past. 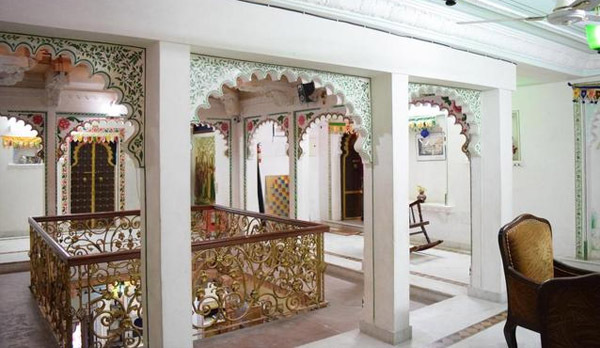 Inside, it is also beautifully decorated that you would feel like part of the Indian royalty of the past. 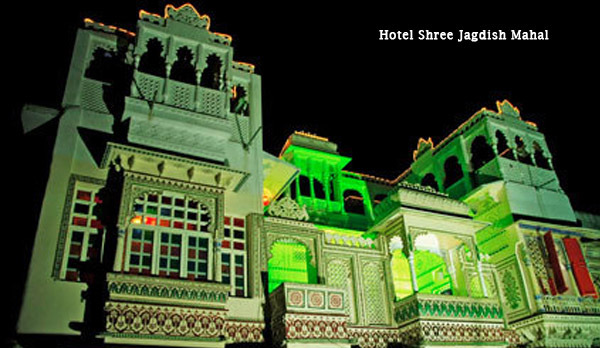 Hotel Shree Jagdish Mahal is located at the City Palace, Udaipur. It may be easily accessed from the City Palace to Ganerao Ki Ghati and from Surajpole via Shrinath JI ki Haveli. Ornate Indian architecture may be observed at Jagdish Mahal. Nestled between the serene surroundings of Aravali hills in Village Hawala of the Suburbs of Udaipur, The Royal Retreat Resort and Spa gives you the treatment fit for monarchy. This palatial resort spreads across many acres and gives guests the feeling of openness, freedom, and opulence. You will be certainly regaled by its rich décor that is composed of antiques and handicraft made by local artisans. The view from the pool of The Royal Retreat Resort and Spa. The resort has a total of 100 well-furnished rooms and has amenities that include a large swimming pool with a stunning view, a wellness spa, fitness centre, as well as a gaming centre. Udaipur is a small city, municipal corporation, and the administrative headquarters of the Udaipur district, within the Indian state of Rajasthan. 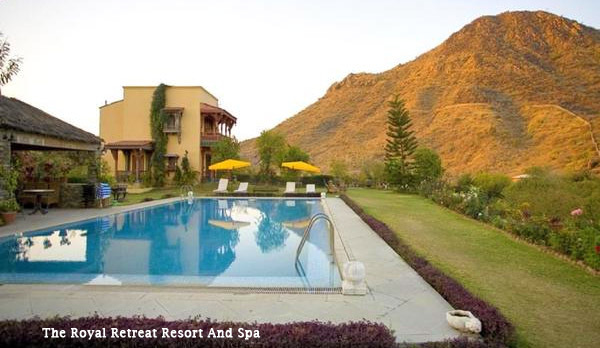 Located on the southernmost part of Rajasthan state near the Gujarat border, it is surrounded by the Aravali Range. It is surrounded by verdant rolling hills and plains and is also known as the “City of Lakes”. The five major lakes are Fateh Sagar Lake, Lake Pichola, Swaroop Sagar Lake, Rangsagar, and Doodh Talai Lake. 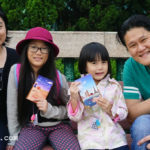 Aside from the lakes, the city is also popular for its massive historic forts and palaces, museums, galleries, gardens, natural tourist spots, and grand temples. Additionally, they hold some of the most splendid traditional fairs, festivals, and other historical events. Hailed as “the most romantic spot on the continent of India” by British administrator James Tod, Udaipur is a popular tourist destination for lovers, millenials, and even families. Udaipur is about 655 km from Delhi and approximately 800 km from Mumbai, two major Indian metro cities. Their architecture is stunning. The Radisson blu looks really good actually they are all so pretty I wouldn’t be able to choose only one to stay in maybe two days in each lol. These do look like some fabulous hotels. I would love to stay at any of them when I visit Udaipur. These Udaipur hotels are indeed amazing! I would definitely love to spend a vacation in one of them! These definitely look like very romantic hotels in Udaipur! That pool at the Royal Retreat Resort is stunning!! Beautiful view! Oh my gosh, these hotels look like getaways in themselves! Between the architecture and the decor- how beautiful! 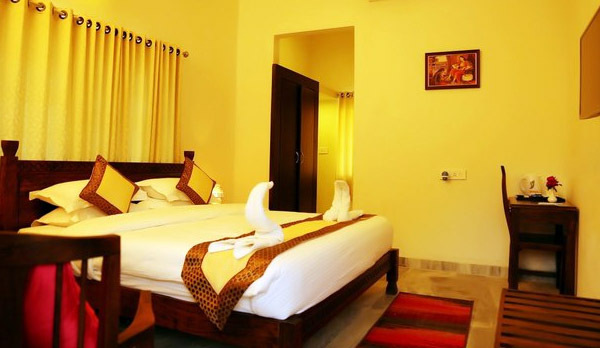 Thank you so much for sharing about Udaipur hotels! Lovely photos. Will be visiting udaipur this Jan. hopefully we can afford to stay in at least one of these places. These hotels are amazing. I just love the views that they have. These hotels in Udaipur are magnificent and awesome! 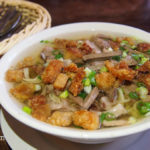 Perfect for staycation! Oh that Radisson hotel is included. 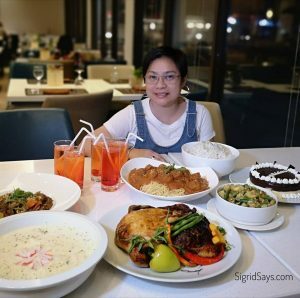 The Radisson hotel group always gives thumbs-up services to many guests. Radisson Blu will have to be my favorite hotel in Udaipur! I have been to Radisson Blu at Nairobi, Kenya and iI absolutely loved the place. So just for that, cheers to all of Radisson Blu! You are in India? Wow…. My favorite hoe to stay Atulya Niwas. The staff is darn great there and they tell me ghost stories whenever I am there. I have never heard of this place. It’s absolutely beautiful and a place I would love to visit one day. So many great photos and they all look better than the next. I can see how Atulya Niwas would be lovely for morning walks as well! Udaipur is beautiful! 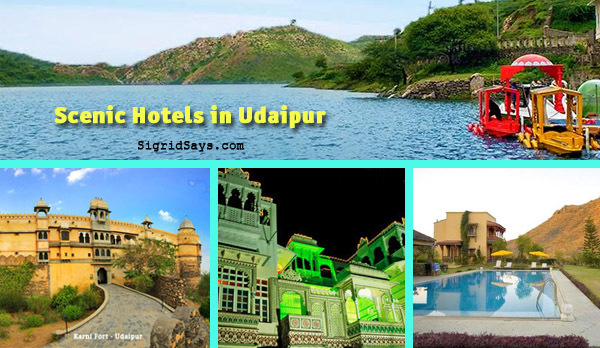 Udaipur is beautiful place, these hotels looks really nice to stay and enjoy the vacation. I never heard of this place but I am open to visit. I am loving all of these villas and hotels in Udaipur and they look comfy to stay in! wow!!! these hotels are scenic indeed!! and some really shines at night!!! wish i could stay in any of these hotels!! !